View More In Food Mills. 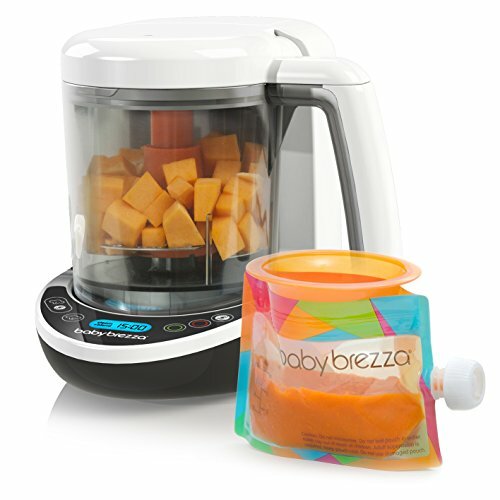 The baby brezza one step baby food maker complete brings healthy, homemade baby food to your table in just minutes. Its one-of-a-kind, patented features take the hassle out of creating delicious, wholesome purees for your baby by automatically blending food after steaming! The bowl has a 3 cup capacity, great for either making a quick meal or cooking several portions at once. The removable water tank makes filling and cleaning a cinch. With the baby brezza one step baby food maker complete, making homemade baby food is truly a breeze! Baby brezza one step baby food maker complete also comes with three reusable feeding and storage pouches, as well as an easy-to-use funnel that makes baby brezza baby food pouches the easiest to fill. 1 Year Limited Warranty. If you have any questions about this product by Baby Brezza, contact us by completing and submitting the form below. If you are looking for a specif part number, please include it with your message.